CCP CEO Hilmar Veigar Petursson on Tuesday took the wraps off Dust 514, a forthcoming console game based on the company’s popular massively multiplayer online (MMO) title EVE Online. Dust 514 is described as “a hybrid MMO/FPS” (First Person Shooter that will interact with EVE Online itself. Petursson made his remarks during a keynote address at the Game Developers Conference in Cologne, Germany. EVE Online, playable on both Mac OS X and Windows, is set in outer space, envisioning a future on the far end of the Universe where mankind has populated a galaxy after being cut off from its homeworld. Players occupy starships as they fly from system to system, carrying cargo, refining materials, mining, pirating, engaging in player vs. player combat, playing a constantly evolving market — the choices are almost endless. The MMO differs from other popular games like World of Warcraft in a few respects. One is its single server design — all players share one common place to play, rather than being fragmented onto server “shards.” Another is the storyline of the game, which is largely dictated by what players do. EVE Online makes a strong emphasis on player-led “corporations” — the equivalent of a guild — whose actions provoke what’s happening in the game. Precious little is known about Dust 514, but CCP is going to make further announcement at its next annual Fanfest gathering in October. Dust 514 will focus on ground combat, with first person shooter and real time strategy game style combat. The game “combines equal parts battlefield reflexes and strategic planning, giving commanders and ground infantry real-time configurable weapons and modular vehicles to manage dynamic battlefield conditions,” according to a press release. Dust 514 won’t require EVE Online to play, but the game will “interact directly” with EVE Online, according to CCP, enabling the console gamers playing Dust 514 to become part of the social experience that makes EVE Online unique. 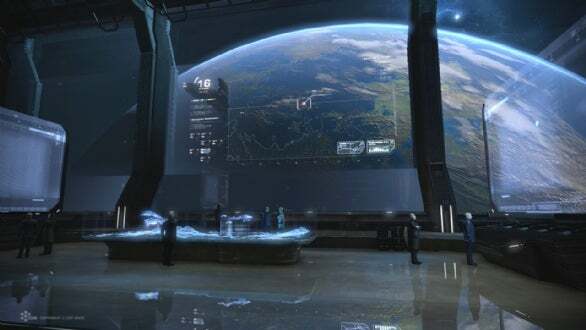 The game is being readied for the current generation of consoles, according to CCP, and has been in development for the past three years at the company’s satellite studio in Shanghai, China. Specific supported platforms and release dates were not announced, but CCP will discuss Dust 514 more at its annual Fanfest gathering in Reykjavik, Iceland in early October.